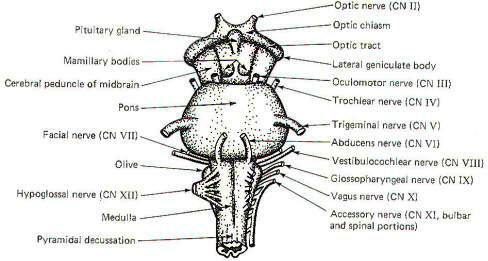 The diencephalon along with the midbrain, pons, and medulla oblongata comprise the brainstem. A clear understanding of the importance of this area of the CNS requires that to be familiar with both its external and internal features. In addition to performing many vitally important regulatory functions (respiratory and cardiovascular), the brainstem also serves as a central point of relay between the cerebrum, the cerebellum, and the receptors and effectors of the cranial and spinal nerves. 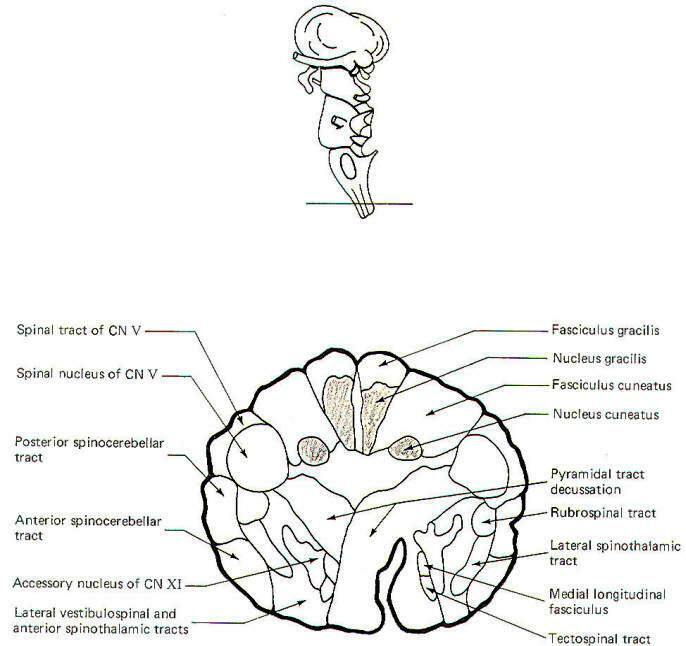 The prominent external features of the brain stem are illustrated in Fig-1,2,3. The cerebrum and cerebellum have been removed in each drawing in order to afford an unobstructed view of the brainstem from anterior, posterior, and lateral perspectives. The most prominent features of the anterior and lateral midbrain are the cerebral peduncles. These broad bundles of descending fibers from the cerebrum converge to form a V on the anterior surface, bounded above by the optic chiasm and below by the superior border of the pons. The mammillary bodies and the pituitary gland are framed by the two peduncles. Four prominent enlargements, the corpora quadrigemina, can be seen on the posterior surface of the midbrain. The quadrigemina (four bodies) include two superior colliculi and two inferior colliculi. The trochlear nerves (IV) emerge from the posterior surface of the midbrain just below the inferior colliculi, wrapping around the cerebral peduncles to appear anterolaterally at the superior border of the pons. The oculomotor nerves (III) also originate in the midbrain, emerging anteriorly at the superior border of the pons. The pons is a distinctively prominent feature of the brainstem. It appears as a broad band of transversely running fibers when viewed anteriorly and from the side. The fibers extend into the cerebellum behind and appear to be holding it to the brainstem. Those which wrap laterally to the cerebellum form the middle cerebellar peduncles. The pons is bounded superiorly by the midbrain and inferiorly by the medulla oblongata. The trigeminal nerves (V) are prominent lateral projections. The abducens nerves (VI) originate in the pons and emerge close together at the anterior inferior border of the pons. The facial nerves (VII), originating in the pons, and the vestibulocochlear nerves (VIII), originating in the pontomedullary area, emerge at the pontomedullary border. Fig-4: The mesencephalon -upper section. 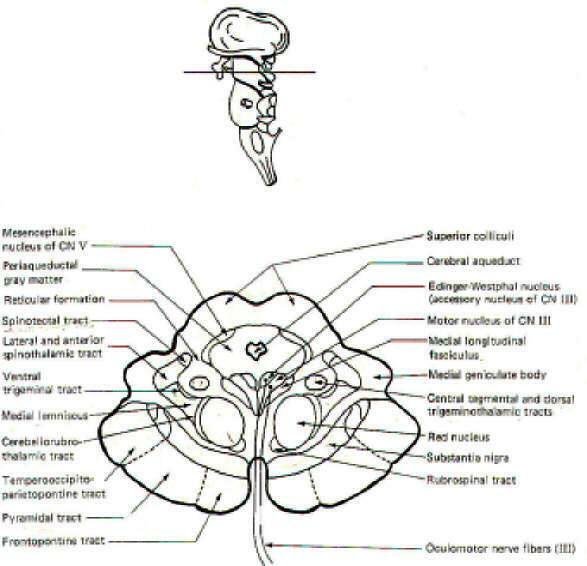 Fig-5: The mesencephalon- lower section. 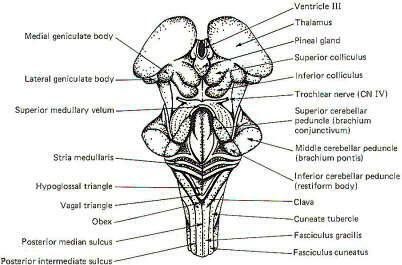 The most prominent anterior features of the medulla oblongata are the medullary pyramids. They appear on the anterior surface as two vertically running rounded eminences which emerge from under the pons to become continuous with the spinal cord below. In the lowest portion of the anterior medulla, descending corticospinal (pyramidal) tract fibers cross over in the pyramidal decussation. 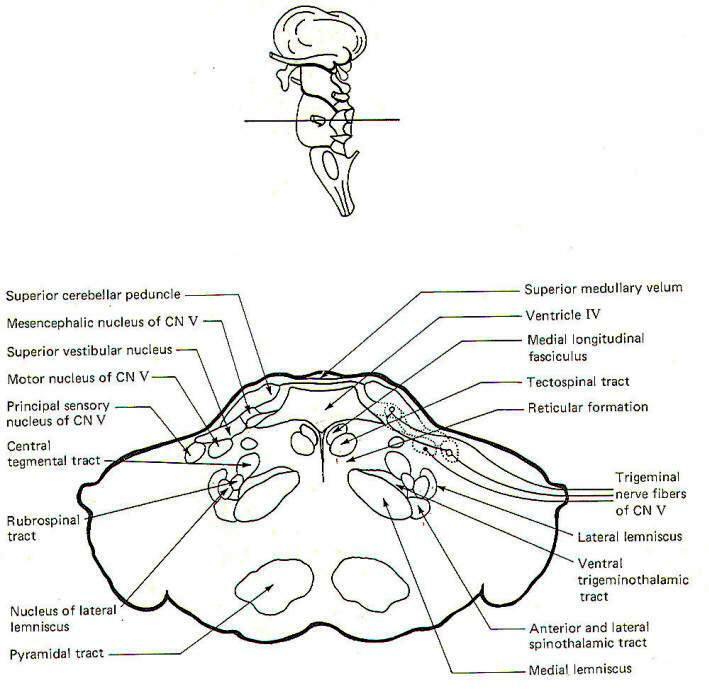 The corticospinal tracts are often called pyramidal tracts because of the unique pyramidal shape they give to the anterior medulla as they descend into the spinal cord. The olive is a lateral feature of the medulla. Emerging from the lateral medulla posterior to the olive in descending order are the glossopharyngeal nerves (IX), the vagus nerves (X), and the bulbar accessory nerves (XI). The hypoglossal nerves (XII) emerge from the lateral medulla anterior to the olive. Three sulci are visible in posterior view, a single posterior median sulcus and two laterally placed posterior intermediate sulci. Two rounded eminences, the gracile tubercle (clava) and the cuneate tubercle are observed on either side of the posterior median sulcus. The fasciculus gracilis leads to the former while the fasciculus cuneatus leads to the latter. The posterior intermediate sulcus separates the fasciculus gracilis and gracile tubercle from the fasciculus cuneatus and cuneate tubercle on either side. As pathways ascend and descend through the brainstem they often undergo shifts in position which can only be seen by a careful examination of cross-sectional anatomy. This is verified by close examination of the eight representative sections schematically illustrated in Figs-4 through 11. There is no real shortcut or alternative to "learning" these cross sections. Indeed, the function of the brainstem as a relay center between the cerebrum above, the cerebellum behind, and the spinal cord below is easier to visualize. As an academic exercise, it is useful to follow the course of pathways through the brainstem. By doing this it is possible to observe how the tracts change in relative position and size as they descend through the stem. For example, the corticospinal tracts enter the brainstem in the middle third of the basis pedunculi (ventral portion) of the cerebral peduncles where they are widely separated from each other. As they descend through the pons they move to a deeper position away from the surface. However, upon entering the medulla they begin to converge and once again move to the surface, giving rise to the medullary pyramids. Bundles of crossing fibers of these tracts can be observed in the pyramidal decussation in the lower medulla. Cranial nerve fibers are classified as general or special, somatic or visceral, and afferent or efferent. Special fibers are those which innervate the special sense organs associated with hearing, seeing, smelling, and tasting. In addition, they innervate the vestibular apparatus and those skeletal muscles derived from the mesoderm of the branchial arches. This latter group includes the muscles of facial expression and mastication as well as laryngeal and pharyngeal muscles. Also included are the sternomastoid and trapezius muscles. All other cranial nerve fibers are classified as general. Fibers are further designated somatic or visceral. Somatic fibers innervate those skeletal muscles derived from mesodermal somites as well as innervating structures of ectodermal origin. The latter include the skin, the eye, the vestibular apparatus, and the inner ear. Exceptions are the olfactory epithelium and the taste buds. Even though the olfactory epithelium and taste buds are of ectodermal origin, the cranial nerve fibers innervating them are classified as visceral because of the close functional relationship which the senses of smell and taste have with the truly visceral gastrointestinal tract. Visceral fibers innervate structures of entodermal origin including cardiac muscle, smooth muscle, and glands. Also included here are those skeletal muscles derived from the mesoderm of the branchial arches. As previously noted, cranial nerve fibers mediating smell (I) and taste (VII, IX, and X) are typically included here rather than with the somatic group. Cranial nerve fibers are also classified as afferent or efferent, depending on the direction of their impulse conduction. Afferent fibers conduct impulses toward the CNS while efferent fibers conduct them away. An oddity in the classification scheme arises from the practice of classifying all proprioceptors as general somatic regardless of whether they are associated with somatic or branchial muscles. This leads to the confusing observation that a muscle can be innervated by both special visceral efferent and special somatic afferent fibers at the same time. The muscles of mastication are an example (Fig-14). The scheme of cranial nerve fiber classification is presented again in Table-1. When the embryonic neural tube closes, a groove remains in each lateral wall which separates the posterior from the anterior portions. The former gives rise to the alar lamina or plate, while the latter forms the basal lamina (Fig. 9-12). 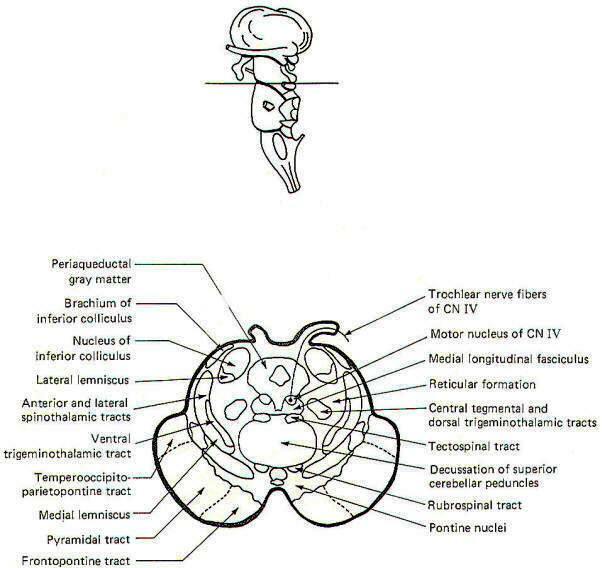 Brainstem sensory nuclei are found in the alar lamina, while motor nuclei are generally distributed in the basal lamina. 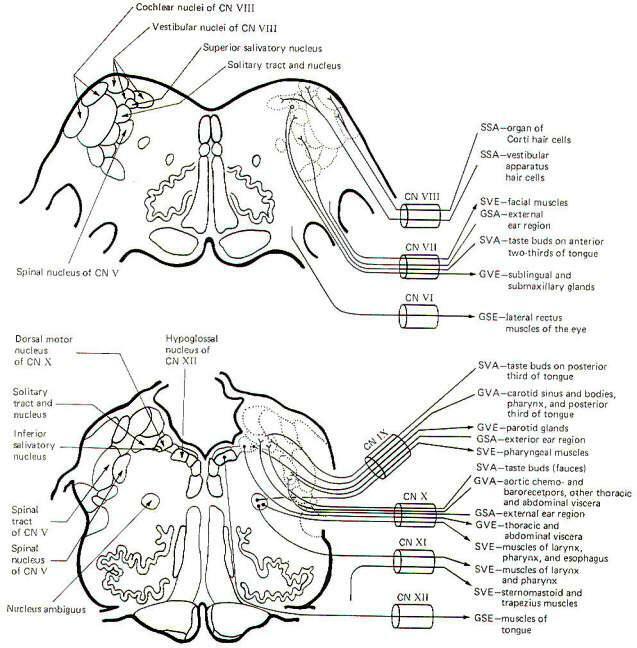 Figure 9-12 is a composite sketch of cranial nerve nuclei as found in the brainstem from the midbrain to the medulla oblongata. 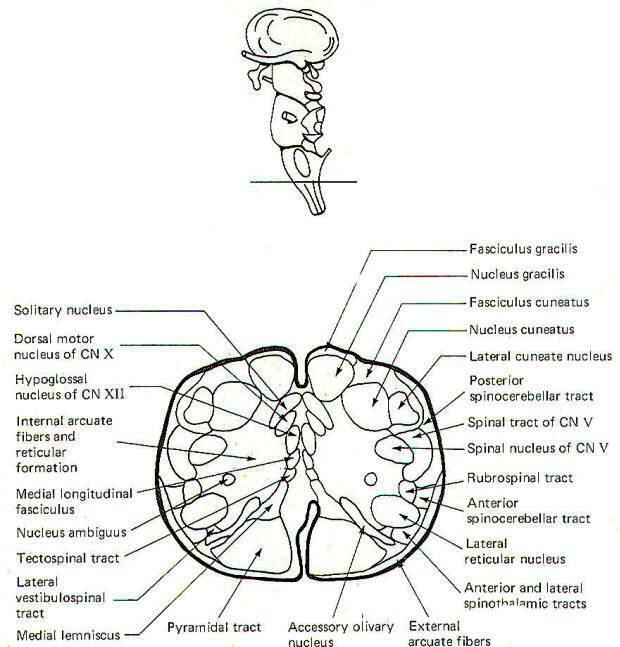 It is not a sketch of any single brain stem section but instead represents a construct intended to show the relative positions of the nuclei with respect to each other in cross section. 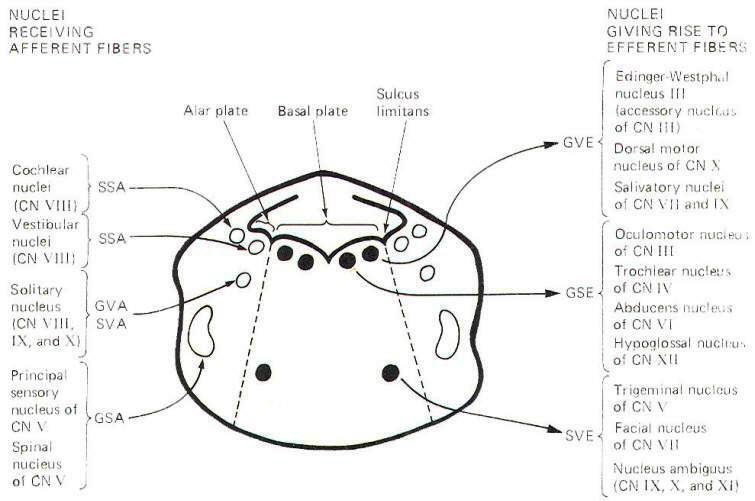 Notice that the efferent (motor) nuclei are located in the basal plate, while the afferent (sensory) nuclei are located in the more lateral alar plates. The dividing line is the sulcus limitans. 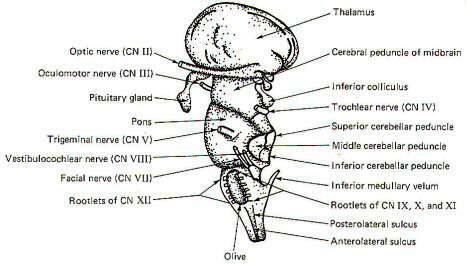 It is not too difficult to trace the emergence of each cranial nerve from the brainstem. A more difficult task is to appreciate the distinct fiber types present in each cranial nerve. But unquestionably the most difficult task of all is to trace the efferent origins and afferent terminations of the cranial nerve fibers in the brainstem. These relationships are illustrated in Figs. 9-13 through 9-15. Olfactory Nerve (I): The fibers of this nerve are SVA. They carry information pertinent to smell from the olfactory epithelium to the dendritic glomerular zone of the mitral cells in the olfactory bulb. Mitral cell fibers then conduct smell information to the olfactory cortex. Damage to these tracts causes anosmia (loss of the sense of smell). Optic Nerve (II): The fibers of this nerve are SSA. They conduct information concerning vision from the ganglion cell layer of the retina primarily to the lateral geniculate bodies. Damage to these fibers causes anopsia (loss of vision). Oculomotor Nerve (III): The oculomotor nerve contains GVE and GSE fibers. The GVE fibers originate in the Edinger-Westphal nucleus (an accessory nucleus of III) in the upper midbrain. They represent the preganglionic parasymapthetic fibers to the ciliary ganglion. Postganglionic fibers innervate the ciliary muscles, which control the thickness of the lens, as well as the sphincter muscles of the iris, which control pupil size. Damage to these fibers eliminates the pupillary light reflex and interferes with accommodation reflexes. The GSE fibers originate in the oculomotor nucleus in the upper midbrain. They innervate the inferior oblique as well as the superior, medial, and inferior rectus muscles of the eye. Damage to these fibers results in external strabismus and ptosis of the eyelid. Trochlear Nerve (IV): The fibers of this nerve are GSE. They originate in the trochlear nucleus of the lower midbrain. They innervate the superior oblique muscles of the eye. Damage to these fibers causes the eyes to look slightly upward. Trigeminal Nerve (V): The trigeminal nerve contains SVE and GSA fibers. 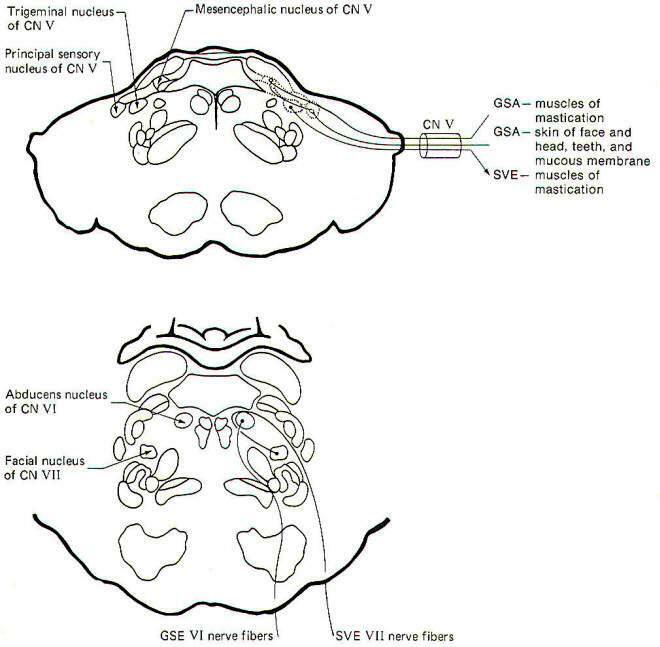 The SVE fibers originate in the trigeminal nucleus located in the middle pons. They innervate the muscles of mastication (branchiomeric origin). Damage to these muscles causes paralysis of the jaws. GSA fibers fall into two groups, those from proprioceptors and those from exteroceptors. 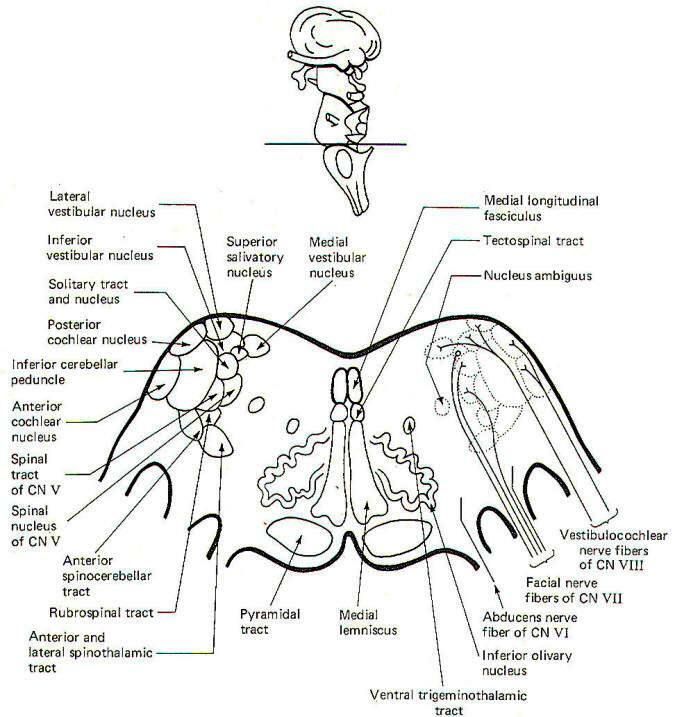 Proprioceptive fibers have their cell bodies in the mesencephalic nucleus of V and terminate in the principal sensory nucleus of V in the pons. Exteroceptive fibers from the skin of the face and head as well as the teeth and the mucous membranes conduct information to the principal sensory nucleus of V. Damage to these fibers causes anaesthesia in the affected area. Abducens Nerve (VI): The fibers of this nerve are GSE. They originate in the abducens nucleus in the lower pons and innervate the lateral rectus muscle of the eye. Damage to these fibers causes internal strabismus and double vision. 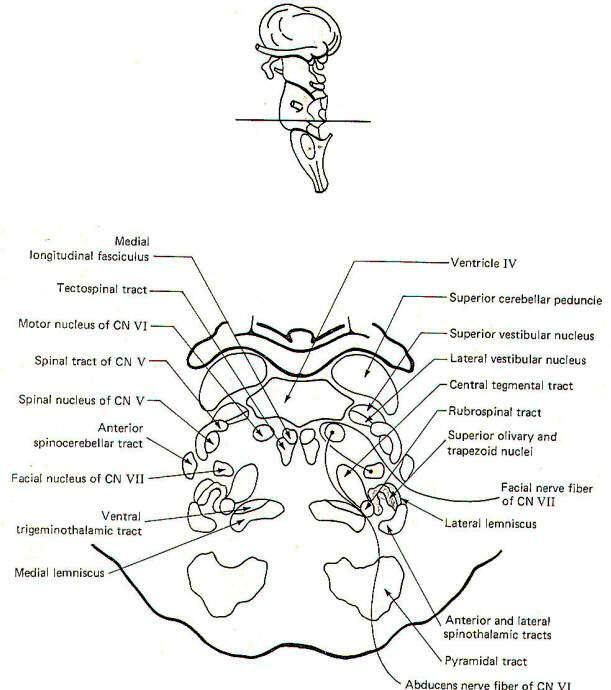 Facial Nerve (VII): The facial nerve is composed of SVE, GVE, GSA, and SVA fibers. The SVE fibers originate in the facial nucleus of the pons and innervate the muscles of facial expression. Damage to these fibers causes facial paralysis. The GVE fibers are the preganglionic parasympathetic fibers to the submaxillary ganglion. They originate in the superior salivatory nucleus of the pontomedullary region. Postganglionic fibers innervate the submaxillary and sublingual salivary glands. The GSA fibers conduct information from the skin of the external ear region to the spinal tract and nucleus of V. The SVA fibers conduct information from the taste buds on the anterior two-thirds of the tongue to the solitary tract and nucleus. Vestibulocochlear Nerve (VIII): The fibers of this nerve are SSA. SSA fibers from the organ of Corti hair cells conduct auditory information to the cochlear nuclei of the pontomedullary region. SSA fibers from the vestibular apparatus hair cells conduct information concerning equilibrium to the vestibular nuclei in the same general region. 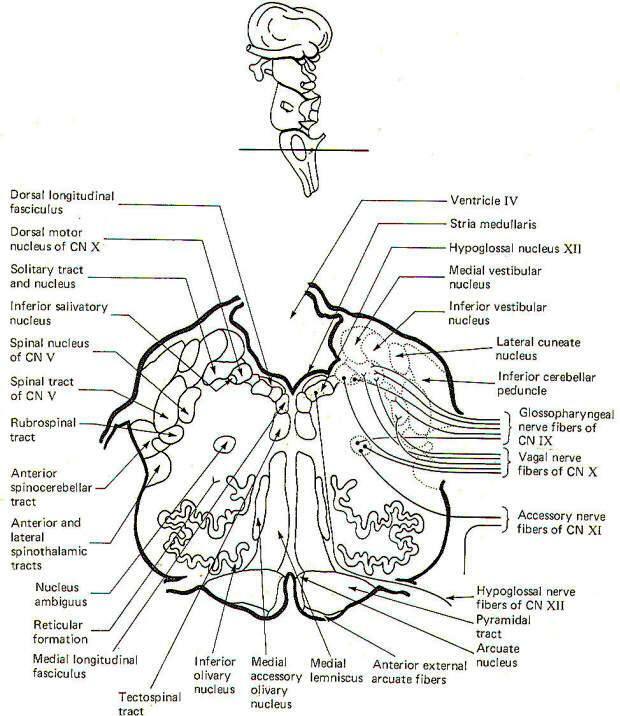 Glossopharyngeal Nerve (IX): The glossopharyngeal nerve is composed of GVE, SVE, GVA, GSA, and SVA fibers. 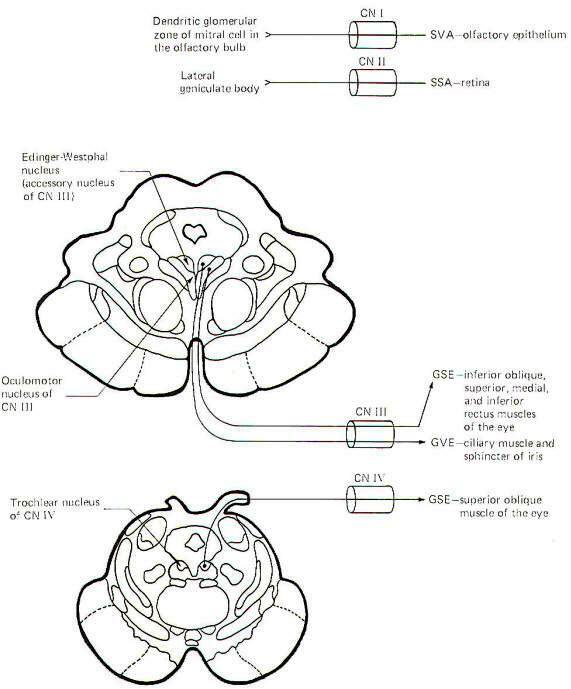 The GVE fibers originate in the inferior salivatory nucleus. These are preganglionic parasympathetic fibers to the otic ganglion. Postganglionic fibers innervate the parotid salivary glands. The SVE fibers originate in the nucleus ambiguus and innervate the pharyngeal muscles (branchiomeric origin). GVA fibers conduct information from the pharynx and posterior third of the tongue. These fibers also innervate the carotid sinus baroreceptors and carotid body chemoreceptors. Signals are conducted to the solitary tract and nucleus. The GSA fibers conduct information from the skin of the external ear region to the spinal tract and nucleus of V. SVA fibers carry information from the taste buds on the posterior third of the tongue to the solitary tract and nucleus. Vagus Nerve (X): The vagus nerve is composed of GVE, SVE, GSA, GVA, and SVA fibers. The GVE fibers originate in the dorsal motor nucleus of X and innervate thoracic and abdominal viscera. These are the parasympathetic fibers of the vagus nerve. The SVE fibers innervate the muscles of the larynx and pharynx (branchiomeric origin) and originate in the nucleus ambiguus. The GSA fibers carry information from the skin of the ear region to the spinal tract and nucleus of V. GVA fibers conduct signals from the aortic baroreceptors and chemoreceptors as well as other thoracic and abdominal viscera to the solitary tract and nucleus. Taste cells in the fauces send signals over SVA fibers to the solitary tract and nucleus. Accessory Nerve (XI): The fibers of the accessory nerve are SVE. There are two components to this nerve, a bulbar component arising from nuclei within the brain stem and a spinal component arising from nuclei in upper cervical levels of the spinal cord. The SVE fibers which arise from the nucleus ambiguus of the medulla innervate the muscles of the larynx and pharynx (branchiomeric origin). SVE fibers arising in the spinal accessory nucleus in the upper cervical levels of the cord innervate the sternomastoid and trapezius muscles (also of branchiomeric origin). Hypoglossal Nerve (XII): The fibers of this nerve are GSE. They originate in the hypoglossal nucleus of the medulla and innervate the muscles of the tongue.